Seek out some peace on the Isle of Skye at Hame, a sleek and stylish country bolthole that brings a touch of Scandi-chic to a spectacularly Scottish scene. 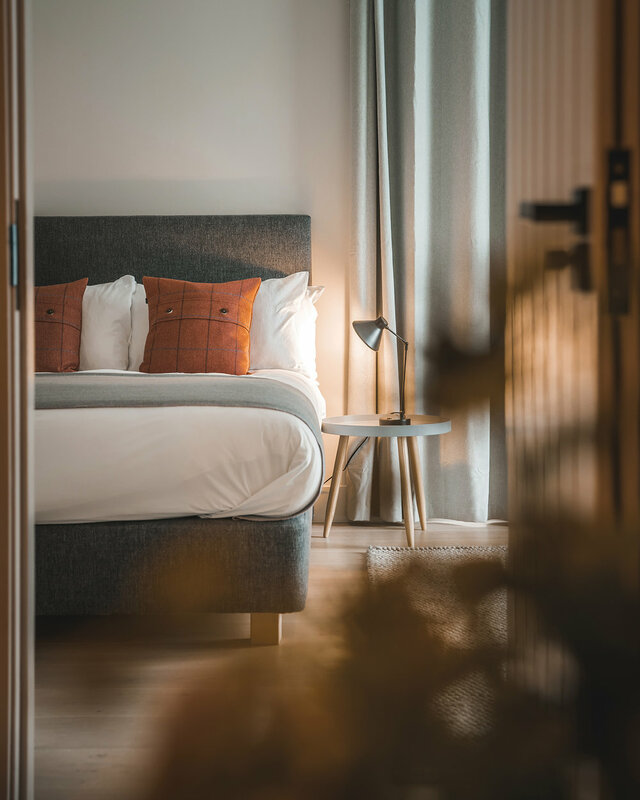 That Mungo and Flora Laing were living in London’s hip Hackney district when the idea of Hame first came about will be of little surprise to anyone who has set foot inside their stylish bolthole on Skye – a traditional tartan shortbread tin of a country hotel it is not. The couple, who took over the waterside property on Skye earlier this year, had initially been approached by Calum MacKinnon, one half of the team behind London and the highlands’ renowned Mac & Wild restaurants, who believed he’d found an ideal spot for an island getaway. The couple agreed, and began making preparations to leave London, somehow embarking on a full renovation of the property late last year at the same time as getting married and becoming parents. Billed as ‘a hame from home’ the relaxed and stylish vibe the Laings have created melds minimalist Scandi-chic with a Scottish fusion style, bringing in hints of tradition through soft furnishings by modern tartan brand Anta. The property’s views over the water to the Black Cuillins form a focal point from the bar and dining room, while works by Scottish artists Alasdair Hillery (AKA Loon, Flora’s dad), Mungo’s mum Jane Laing and Oban’s renowned Moggs Mellor abound. Elsewhere, the rooms themselves find the balance between laidback and luxury, with sleek en suites, flat screen TVs and extras ranging from Eteaket teas, Tunnock’s teacakes and fizzy Glenlivet water, as well as coffee liqueur by Mac & Wild, while the spectacular location on the island’s north coast grants guests easy access to some of its most famed attractions, from Dunvegan Castle to the Carbost Faerie Pools. While the property doesn’t host a traditional restaurant, the culinary connection is strongly felt, with meals created on site to customer order. “We’ve learned a great deal from Calum, who originally found this place and has been integral to so much of what makes Hame a success,” says Mungo of the property’s approach to local food sourcing. This local family business serves up freshly shucked oysters, harvested daily from their farm in Loch Harport. There’s also a farm shop offering all manner of local produce, from fresh crab and lobster to venison and cheese. A visit to Skye wouldn’t be complete without a tour of the island’s oldest working distillery. Set on the shores of Loch Harport, the dramatic views are almost as memorable as the drams themselves. Head to the picturesque village of Waternish for a tour of the sole remaining commercial woolskin tannery in Scotland, before shopping for beautiful sheepskin rugs, slippers and accessories. Set at the foot of the Black Cuillins, these beautifully crystal-clear blue pools on the River Brittle are among Scotland’s most popular wild swimming spots. For those averse to the cold, however, they also make for some beautiful photography. A world-renowned restaurant with rooms, The Three Chimneys serves up some of Skye’s finest seasonal produce in a spectacular setting that has been drawing crowds since 1985 – don’t forget to book in advance.